Today I'm delighted to welcome author John Mugglebee to my blog. I have to confess, I misread the author's name when I first saw it, as I know people in England with the surname Muggleton, related to a historical sect, the Muggletonians. But that's not John's name, so I'm delighted to welcome him here where he can clarify, just What is in a Name? Neespaugot is a historical novel recounting over several centuries the trials (in some cases, literal ones) and tribulations of a mixed race, multiethnic family. Readers have asked me about a variety of topics ranging from writing technique to history, setting to character, Native American culture to personal influences. But there’s one question nobody has yet asked: What gives with the last name on the book cover? genuine, despite its obvious Anglo-Saxon skeins. So, is it real? Or is it borrowed from the non-magical folks in Harry Potter? And if it is genuine, what’s its origin? Finally, what part, if any, did the name play in the theme of Neespaugot and in the lives of the story’s characters? It’s true, my last name is an invention, but it’s no nom-de-plume. I was born with it, my dad as well, but he and his siblings were the first generation to schlep the name from start to finish. My paternal grandparents had been called something different back in the old country, but upon their arrival in America, the old name had been chased from memory, a fairly common practice for the times, since most immigrants preferred to turn their backs on the misery they had left behind and instead face the future head on. My grandparents came to America in 1882, following what was no doubt a brutal slog across Europe after a murderous escape from the Pale of Settlement. The Pale was a 700-mile-long pen stretching along the Russian Empire’s western frontier, into which Catherine the Great had herded the empire’s Jews where they could be systematically attacked and slaughtered. In 1881, the reformist Tsar Alexander II was assassinated by anti-reform terrorists, but the Russian ministry blamed his murder on the Jews, setting off the worst anti-Semitic attacks in the history of the Pale. Hence, the first mass exodus from Eastern Europe towards America. Somewhere along their road to freedom, my grandparents had let the old family name sink into the muck of history and had embraced the new one. My dad, born 14 years later, on the eve of a new century, adopted a laissez-faire attitude towards the past. Unlike my mom, who was proud of her family’s multiracial history, my dad was indifferent to his heritage and more than content to carry around a last name that meant nothing to anyone. He considered it an unburdening from convention, and he took full advantage of his freedom, living multiple lives before the age of 40, and then, against his family’s wishes, marrying a “colored” woman half his age. Each generation saw the name differently. For my grandfather, Mugglebee was a ticket to a better place. For my dad, it represented a Gatsbyesque repudiation of the past. For me, it was a source of embarrassment. Growing up I cringed every time a teacher roll-called my name. It wasn’t just because Mugglebee sounded funny and kids made fun of it and adults wanted to inject an ”S” between muggle and bee. What hurt was not knowing how to respond to, “Where’s that come from?” I felt dumb sputtering, “Erm, I don’t know, it’s made up.” Later, the name would become like the stray dogs that ended up at our place, often ugly, sometimes sick or lame, but definitely mine to be owned and loved. The story of my name is one of oppression and flight, indomitable courage and resiliency, repudiation and reinvention, recognition and responsibility—all themes that have worked their way into the telling of Neespaugot. Multiple characters are affected for better or worse by a contrived name. The English colonists call the Indian chief Metacom “King Philip” to demean him, but he turns their joke against them. Melba Blue Jay is forced into foreign slavery and prostitution, stripped of her homeland, people and language—and her name. Lydia Freeman carries around a status for a name, free man being an indication to the authorities not to re-enslave her; her deepest sadness is not knowing the names of her parents. Ching Ah Chung is taken as a young boy to America and renamed Joseph in order to cleanse the Chinese out of him. Ezekiel Roxxmott, raised a Jew in a predominantly Italian neighborhood, believes that the names of people are as much a tell as skin color and hair texture, so, to get ahead in life, he changes his own name to Roxxmotto, opens a law practice in Little Italy and runs for mayor of Neespaugot as an Italian-American, with disastrous consequences. During the famous balcony scene in Romeo and Juliet, the heroine decries the absurdity of something as amorphous as a name stymieing the lovers’ relationship. “What’s in a name? It is nor hand, nor foot, nor arm, nor face, nor any other part belonging to a man.” She’s right—a name in itself is a trifling thing. But whether in affairs of the heart or in a racial and ethnic context, the consequences of a name can be great. A name can present both a means and an impediment to one’s happiness. It can determine one’s fate. What’s in a name? A lot. Meet the author on Facebook or Twitter. The tribes of Massachusetts are outnumbered by white men, and the white Christian leader of dark-skinned men has fallen prey to drink. Covenants are null and void, their “terms died with the Sachem.” And nothing changes in politics or war. So starts John Mugglebee’s tale of Indians and more. A coin minted for trust becomes an emblem of belonging and history. Memories are lost with the land. Love is elusive. And family demands a home. Well-researched details anchor the story in American history. Well-chosen words bring foreign languages to life without ever feeling intrusive. Well-drawn characters are strong, flawed, determined and relatable. And a genuine sense of human sins and frailties fills the pages, from rejected Indian to runaway slave, from Chinaman to French, from Canada to foreign shores and back. Neespaugot views human sins through unfiltered eyes, recognizes our crimes, then builds stories and characters each with just enough good in them to feel real. 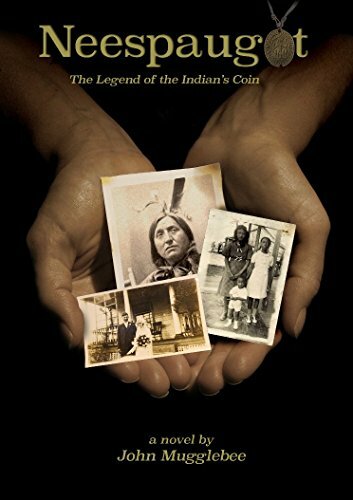 The coin might be a tie to the land, or to an idea, to family, belonging or hope. Or it might just be a coin. The land might belong to tribe or nation or none. But the lives belong solely to themselves, transcendence lies beyond the labels we apply, and all of us are mongrels in the end. The storyline spreads from past to present, through generations of large and small betrayals, assumptions and denials. It’s beautifully told. It’s characters are hauntingly real. And it’s ending, firmly anchored in the present, is smoothly powerful and achingly real. I really enjoyed it. Disclosure: I was given an ecopy and I freely offer my honest review. I loved it. I am so glad you enjoyed the book! Thanks for hosting John!